Navigational rallies, also known as Time Speed Distance (TSD) rallies, incorporate a driver and navigator working together in a typical street car to follow a route laid out on public roads in a set of instructions. The objective is to collect all the checkpoints on the route at specific times which you can do by following the average speeds indicated in the instructions. If you arrive at a checkpoint too soon or too late, you’ll accumulate penalty minutes. The team with the fewest penalty minutes wins. These events typically have two or three levels of difficulty and a quick lesson before the event for first-time participants. 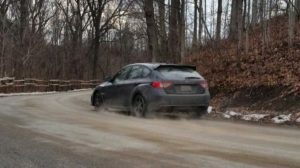 Navigational rallies are a great way to see picturesque areas off the beaten path and explore regions you wouldn’t normally visit and meet an interesting group of like-minded car enthusiasts too. There’s usually a social gathering after each event where people share stories of their adventure, try to find reason as to why they ended up 5 kms off course, and drivers and navigators make amends for things said in the car. 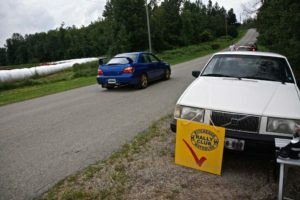 Rally Sport Ontario’s affiliate clubs host several events each year that are part of the Ontario Road Rally Championship (ORRC). These events are usually about 200 kms long and take about 5 hours to complete. 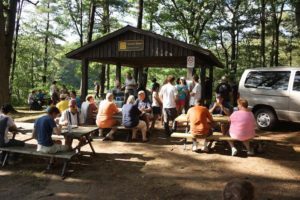 Some of the clubs also host their own rally series, annual, and/or one-off events which are typically shorter and cater to beginners. Check the event calendar for upcoming rallies.